Let’s Scrap Letter of the Week! | Stacy Benge, M.S. Let’s Scrap Letter of the Week! Posted in Alphabet knowledge, Language development, Literacy development	by Stacy Benge, M.S. It’s not that “letter of the week” is horrible, it is not always optimal. Without going into a dissertation, the biggest problem comes down to the overemphasis on letter instruction. There is a huge misconception that learning letters is the core of literacy development when, in fact, although important, it is only a small portion of what is needed for children to learn how to read. (Other important components: receptive and expressive language skills, sound awareness and production, visual and auditory discrimination, phonemic awareness, vocabulary development, memory and sequential skills for comprehension, print awareness, AND motivation – to name a few. Oh – and those all have subcategories too!). 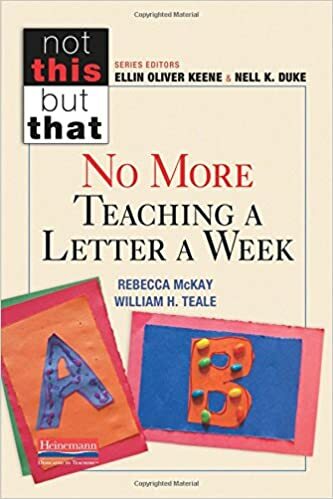 The result is programs tend to base their entire curriculum around a “letter of the week” format and sometimes neglect the other aspects of literacy development. So, specifically for a child to acquire alphabet knowledge (which is recognizing a letter and connecting it with a sound), he/ she must have visual discrimination skills, auditory discrimination skills, AND the interest in learning the letter, with that last part being the key. So, if an entire week is spent on a letter that in no way pertains to a child and he/ she has no interest in that letter, it creates a week of meaningless experiences. The child will probably “memorize” the letter, but won’t acquire the authentic, foundational knowledge needed about the letter to build upon for literacy development when the time comes. For children under the age of 4: work on the literacy foundational skills listed above. Lots of hands-on experiences for visual and auditory discrimination, singing songs, experiencing different sounds, reading books and discussing the content, lots of conversations, lots of language, lots of play, etc. And, like anything else, this does require constant observation and documentation. It is up to the teacher to keep a journal of some sort to ensure throughout the course of the year that all of the letters have been introduced. It also requires some assessment to document the children’s alphabet knowledge which will also help the teacher in lesson planning. Want some more information? Check out this book. Or better yet, I have a fun training entitled, “Do This, Not That: Alphabet Knowledge” I would love to share with your school or organization! So, there you have it. Just think of how long this would have been if you asked me about formal writing instruction!